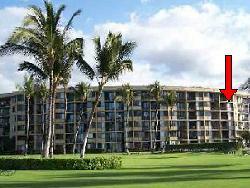 This fifth floor oceanfront condo at the Kihei Surfside Resort is located on the sought after ocean side of the elevator, and in the coveted "2 stack", which are the closest to the ocean one bedroom condos in all of Kihei or Wailea, and definitely one of the best located units at the Kihei Surfside. 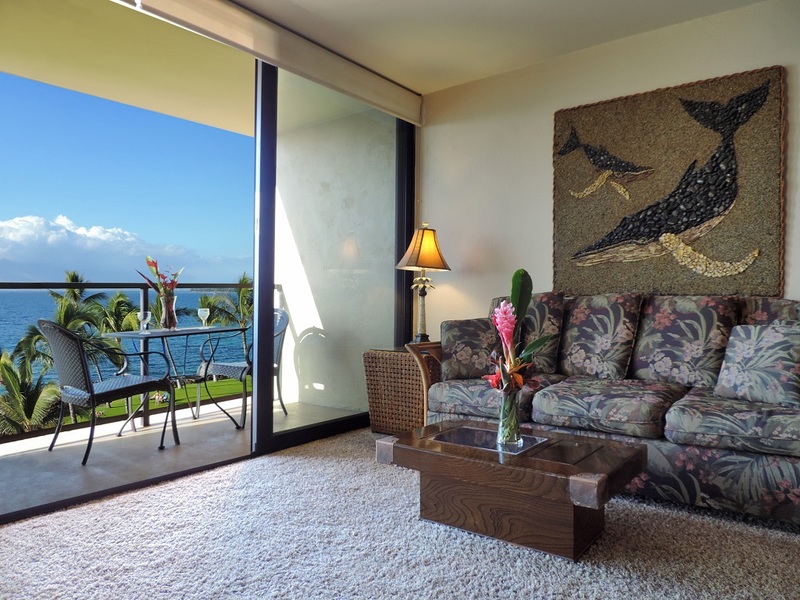 It has a spectacular view from the kitchen, living room, dining area and lanai. It is one of the larger, 1 bedroom, 1.5 bath units (680 sq ft). The view of the ocean and its abundant wildlife is absolutely breathtaking. It has an older remodel, but is clean and functional. Our guests gave this unit a moderate rating in 2009 - 3.84 out of 5 on our Guest Satisfaction Survey Index for 2009, placing it in our "Standard" Category. We have been with the owner to improve the lower scores, having already replaced the window coverings and television, and the entire unit has been painted. The entry hall, kitchen, bathrooms and lanai are tiled, while the living room and bedroom has short pile carpeting. The cabinetry is original with tile countertops. The island style kitchen is functional. 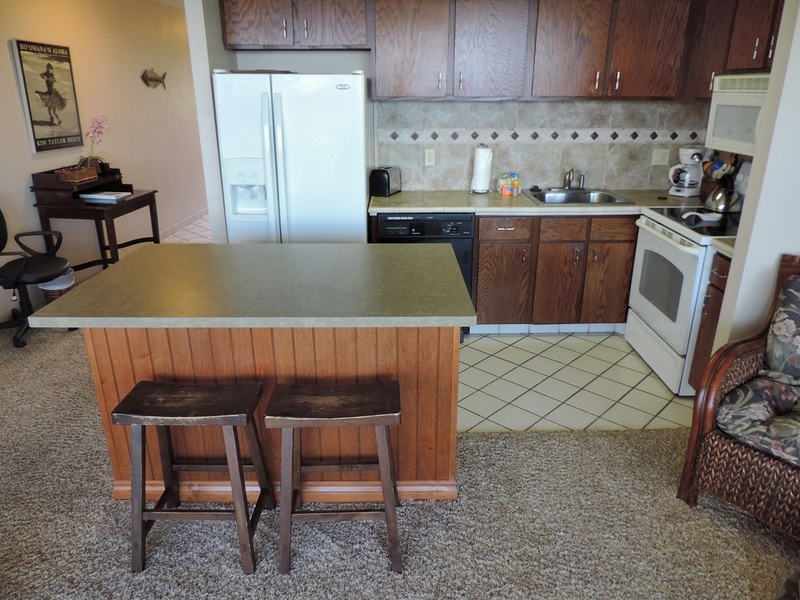 It is fully equipped with white appliances, including fridge/freezer with ice maker, flat top stove, dishwasher, multi function microwave oven, garbage disposer and a variety of small appliances including coffee maker, coffee grinder, toaster, blender, crock pot, rice maker and hand mixer. The living room has a queen size sofa-beds, with 2 comfy, matching swivel/bucket rattan armchairs. There is also a large 37" flat screen LCD color TV with, DVR, and stereo. And of course, a multi speed ceiling fan. The large, private lanai has a two adjustable reclining patio chairs and cocktail table - a perfect place to enjoy your morning coffee or evening cocktails. Turtles and dolphins can be seen year round, whales in season. The entry hall has a full set of dresser drawers, and a desk area with free high speed internet and free long distance calling to the United States and Canada. The bedroom has a King size bed and multi speed ceiling fan. The master bathroom has a walk in shower with a built in bench. 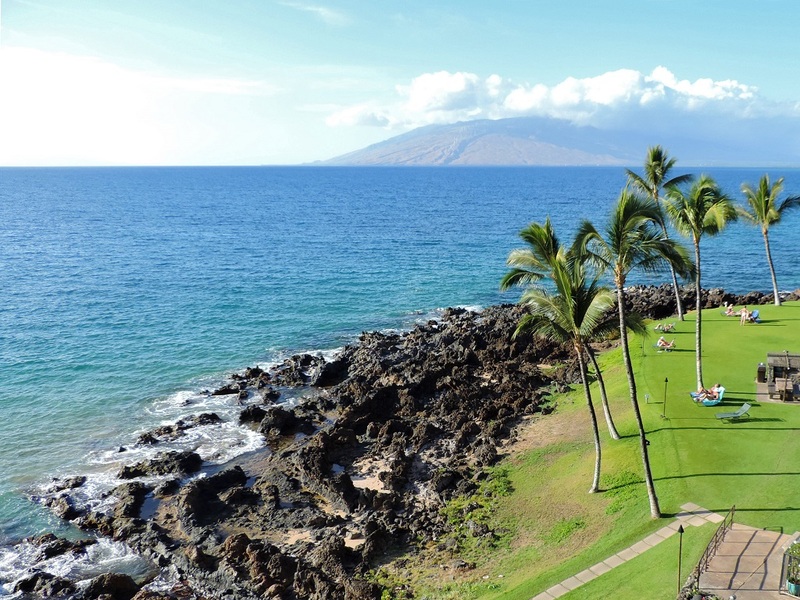 This unit is an excellent choice for guests who are looking for a budget priced, spacious, comfortable condo with a great location and a spectacular unobstructed view of the Pacific Ocean and the West Maui mountains, and can overlook its imperfections.